We deal in Janumet - Januvia Tablets. 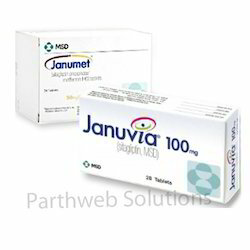 We are an exporter of Janumet - Januvia Tablets. We mainly deal in USA, UK, Australia, Japan, Russia. Brand Parthweb Solution Pvt Ltd. Backed by rich industry experience and knowledge, we are engaged in introducing optimum quality Janumet, Januvia Tablets. These tablets are is a once-daily prescription pill that, along with diet and exercise, helps lower blood sugar levels in adults with type 2 diabetes. Offered tablets are available on various doses & bulk orders as per customer’s requirements. In addition, our offered tablets are tested by our quality experts in order to ensure its quality.